I wanted to show you a great project I came across last week. And before you ask, this is my little pink scarf for my youngest girl in progress last week…. I need to get back there first to get some more wool. 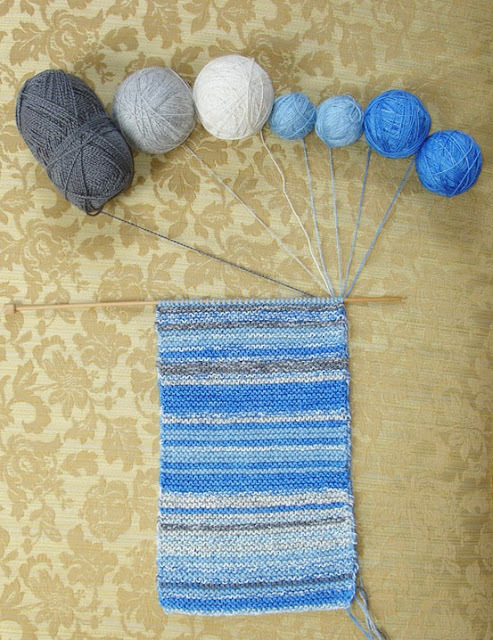 Now if you are new here, this whole knitting thing will not ring a bell…. This is the project from Leaf Cutter Designs and I think it’s such a fun thing to do, I had to show it to you. It’s a Cloud Scarf, how creative is that huh? Everyday you knit one row the same colour as the sky. You can look at the video on the site how it is done. (or shorter) and have a 2012 Cloud Scarf. I think it’s a cool idea! see you after the weekend mes amis! I learned the basics of knitting when I was a little girl and have now forgotten. I’d love to pick it up again…it sounds so peaceful!! The Cloud Scarf is a marvelous idea and so pretty! I wish you much happiness making your projects! Oh, Maureen! You’ve just gone and made this completely necessary to me. I admire your patience for finishing that scarf Maureen (gorgeous colour). I’m hopeless at knitting. My grandmother tried hard to get me to love it, but it just didn’t resonate in the same way that sewing or other crafty things did. Now of course I wish I had taken more notice of all that she taught me! I’m sure your daughter will be thrilled with that little scarf when it is finished, Maureen. Very pretty colour. I used to knit, but haven’t done so for a very long time now, which is a shame really Hope all your Christmas preparations are going well my friend. p.s. love the gift giving tips in the post below this. so great! hope your week has been filled with many blessings! You cloud scarf is coming along splendidly. Love the different hues of blue, so pretty. skin care is so individual -but philosophy & oil of olay have good miceidrrmabrasoon kits. i also hear good things about alpha hydrox glycolic acid. makeup alley is a good place to research this stuff, especially if you’re on an acne regimen. there’s also resources around that show which ingredients in cosmetics are comodegenic. it’s been very beneficial for me. look into taking zinc supplements, clarisonic too. i believe cliniques dramatically different moisture gel may be your cup of tea too. A little “thank you” in my daily post today, lovely girl! Me again maureen. Just wanted to wish you and your family a very very merry Christmas, and happy funfilled days ahead.